In the wisdom of Nature, nothing is ever wasted and nothing thrown away: the loop, though wide, is always closed and self-contained, as one season’s leftovers become the next season’s source of new life. Through change, we are refreshed, restored, and renewed…and so it is, and will be, with the new ownership of Green Camino curbside composting! New VP, Ryan Conway, has been on quite a wild ride, himself: after coming to IU on a FLAS Fellowship to study West African development policy, he found himself impassioned by Nobel Laureate Elinor Ostrom’s work on “the commons” – the things we share and care-for together, like our climate and our soils – and bringing his academic, analytical skills to life in the halls and streets of Bloomington, where he’s conducted policy studies and advocacy campaigns for local food and sustainability efforts, since 2011. 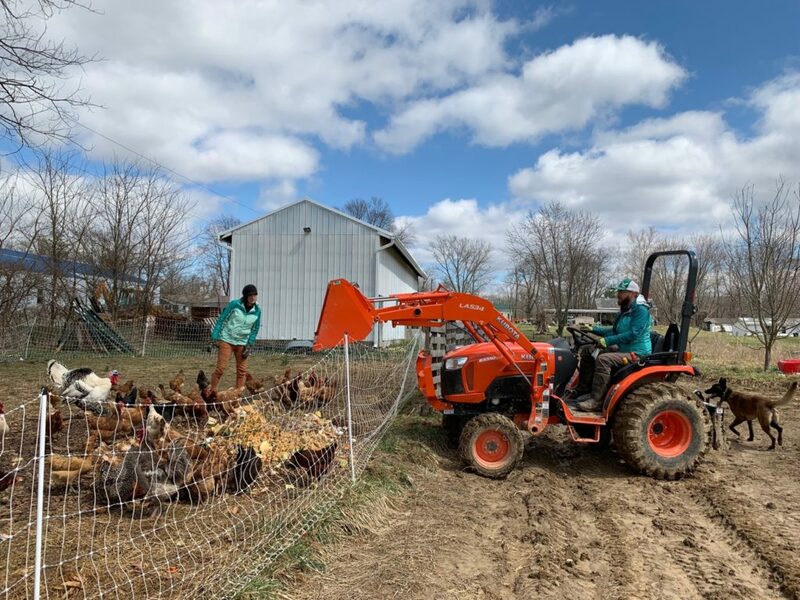 No way would he have ever guessed he’d find himself in the seat of a Kubota tractor, bringing Bloomington’s foodwaste to a happy and frenzied gaggle of over 100 chickens at Fable Farms! So, in our lives, as in Nature, the “leftovers” from our previous paths – the science, the analytics, the workouts, and the community organizing – have all come back around, in surprising and unexpected ways, to become the soil from which our new lives as composter-farmers are growing. So what about this farm? How does it close the loop on food and foodwaste in Bloomington? Committed to the “Sustainability Tripod,” Fable Farms Indiana uses ecologically sound methods to produce accessibly priced, high quality products. But beyond the “Environment” and “Economy” legs of the tripod, Fable Farms is also unique for the “Equity” of its labor practices: through a partnership with local nonprofit Made Up Mind, Inc., Fable Farms employs recently-released ex-offenders, at a real living wage, to work the compost, harvest the fields, and manage the land. Like the Hope and Transformation promised within a seed or freshly-mixed compost pile, our work with ex-offenders offers us experiences of exceptional beauty, where we see the love of the land turn hearts of hurt into lives of light. Thank you for fueling these transformations! We may be new owners of Green Camino and we may be a new farm, but we farmers are proven leaders in community Sustainability organizing and technical know-how. With 3 years as the President of Bloomington’s Center for Sustainable Living, Andrea knows our community’s Sustainability concerns and is committed to moving the ball forward against climate change, starting with “Reduced Food Waste,” which Project Drawdown lists as the #3 way to effectively fight climate change (with Composting making the list, as well). With 3 years as the Chair of the Bloomington Food Policy Council, Ryan has led years of intensive local food system planning and policy change. As a newly appointed Monroe County Soil & Water Conservation District Supervisor, Ryan takes soil and water quality seriously and as a recently-retired member of the Bloomington Commission on Sustainability, he has helped craft the City’s Sustainability vision. 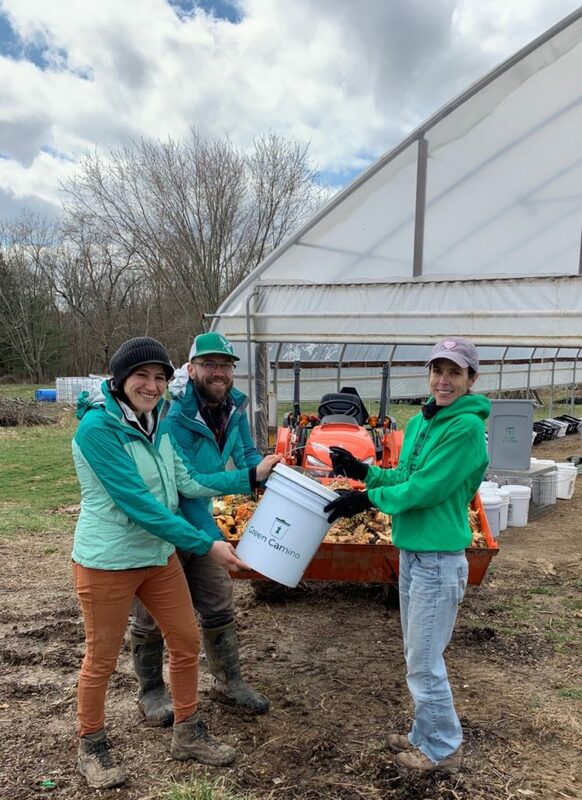 Andrea and Ryan both completed the US Composting Council‘s 40hr Compost Facility Operators Certification Training course and earned their food-growing chops running productivity tests for Bloomington urban-agriculture innovators at the Garden Tower Project. With Ryan’s parents – Kevin and Christy – and his older brother, Sean, moving to the farm in 2018, Fable Farms Indiana is ready to grow and happy to close the loop on foodwaste! So come look for us at the Bloomington Farmers Market or just peek out the window on collection days! Interested in eggs or compost, in addition to your curbside foodwaste collection? Menu of expanded services coming soon! Congrats to the Andrea & Ryan, hope one day they could come to Mexico to teach us some of there soil technology & compost production.